Performance textiles and fabrics are rapidly bringing apparel and footwear products into the 21st century. Manufacturers today are innovating at breakneck speed and bringing to the market synthetic textiles and fabrics with enhanced performance characteristics, or that feature embedded fibers or topical applications. This has led to the widespread introduction of advanced performance apparel and footwear that offer you new levels of comfort and safety. At the same time, sorting through claims regarding the performance characteristics of these advanced textiles and fabrics can present real challenges for manufacturers, retailers and you. At a minimum, the myriad of vague, conflicting or unsubstantiated marketing claims and characterizations used to promote these materials often result in frustration and disappointment. And fraudulent representations can unnecessarily expose apparel manufacturers and retail buyers to potentially hazardous chemicals and other risks. We identify some of the key performance considerations for advanced textiles and fabrics, and review the challenges of vague or unsubstantiated marketing claims used to promote these products. 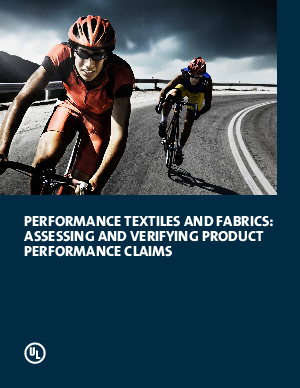 Our white paper also discusses the importance of verifying performance claims, and offers an overview of our marketing claim verification services for performance textiles and fabrics.